Enter to win a huge Craft Haul! Visit CraftHaul.com this week to enter to win a huge craft haul filled with tons of new products from some of your favorite craft manufacturers who exhibited at the Craft & Hobby show last week! Tiffany Windsor and I spent a couple days at the show in Las Vegas with our video camera, filming over a dozen manufacturers talk a bit about the products they were featuring in their booth. Visit CraftHaul.com each day between now and August 10th to see a new video from the show and get inspired to try some new products! I really like these large-hole glass beads from Prima Bead - and the smaller metallic beads nest just inside the glass beads perfectly so they don't shift on the headpins. Here are the supplies I used...for each dangle, arrange your beads on a headpin, add a loop to the top, then slip it on to your earwire or chain. The little crystal beads are the perfect finishing touch at the top and bottom of each dangle. In just a few minutes, you can make a set of earrings and a necklace to match whatever outfit you're wearing. I really love using beads that come together in a pre-designed mix - makes the process quick and easy, especially when the company sends you such a generous selection of products to choose from! I'm very happy to contribute projects to the folks at Prima Bead - keep an eye on my blog for more ways I'll be using beads and findings in my projects - from jewelry to cardmaking, mixed media to general crafts - my head is spinning with ideas! How many craft products can you identify? Take a guess and enter to win! I put 30 different craft products in this picture...how many can you identify by brand or type? Some are super easy, but even with the dark neon filter, I bet you can guess almost all of them! Write the names of as many brands or types of products as you can in the comments. I will pick a comment at random to win a FABULOUS assortment of craft products from a variety of manufacturers, valued at over $75! Good luck and have fun staring at the picture...the person who can guess them all clearly digs crafting the most! In my latest project for Cool2Craft and Spellbinders, I created this 11" x 14" mixed media art panel using Spellbinders craft foils along with Idea-ology Philosophy Tags by Tim Holtz. I embossed the foils with Spellbinders M-Bossabilities folders and then tiled them on to a wood panel that I painted silver to look like sheet metal. Click here for project instructions and my video tutorial. Mosaic tiles on greeting cards with Rowlux Illusion Film plus a blog hop and giveaway! Rowlux® Illusion Film is rockin' good fun for making mosaics on greeting cards! When I first pulled all the different colors out of the package that the folks at Rowlux were kind enough to send me, the cardmaker in me got really excited. I knew I wanted to see all the colors and patterns tiled together. Rowlux is a thick, polycarbonate sheet (kind of like acetate) with wavy, holographic-style moiré patterns. It comes in loads of bright and bold colors. It's translucent, but also has some opacity - scroll down to the end of this post to see how the different colors look against black versus white. I really like how the patterns pop against the black. Choosing the right adhesive to work with Rowlux without killing the optical effects is a bit tricky. Any kind of glue dot or foam square will show through. A dry-mount spray adhesive is recommended because liquid glue can cloud up the pattern. I didn't have any dry-mount spray, and I was hesitant to go to the art store to buy it because I tend to walk out with way more than I went in for, lol. So I tried dry-brushing a super light coat of clear gel glue on each inchie tile for first card (above) and after letting it dry for an hour or so, I was able to press most of the cloudiness away with my bone folder and it I think it still looks pretty good. But the glue isn't really intended for "plastic" to paper applications...the tiles are gently adhered and they'll stay put, but it's not hard to slide your fingernail underneath and pull them off the card. Then I decided to try incorporating the adhesive into the design with my second card. I had these black foam squares which were easy to center on to each tile because of the sheet's translucency, plus I was working on top of black cardstock...so it was perfect! I absolutely love how this second mosaic turned out, and the foam adhesive is totally staying put on the Rowlux. Enter the giveaway and scroll down to read a few words from our blog hop host, Marisa Pawelko - The Modern Surrealist. Then see what other designers are making with Rowlux and click through the blog hop - so many inspiring project ideas! 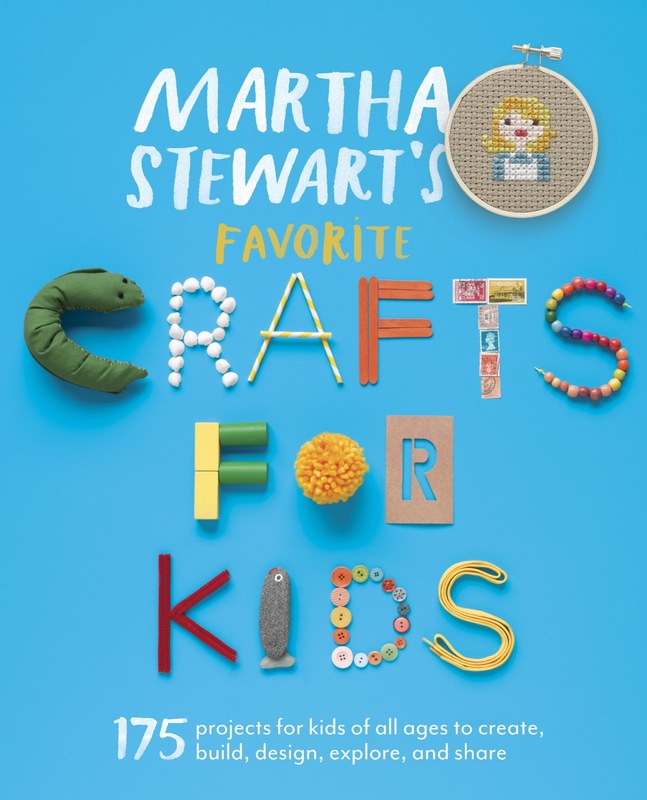 Book review: Martha Stewart's Favorite Crafts for Kids - with a giveaway! I don't have any kids of my own...but boy oh boy, if I did, Martha Stewart's Favorite Crafts for Kids would be my weekend and summertime bible! 340 pages are filled with every craft you ever did as a kid in school or at camp, and then some. 175 crafts to be exact...each turn of the page brought back some great memories. The photography is terrific and the instructions are simple and brief. Templates and step-out pics are provided for many projects, and the supplies are either inexpensive or already in your home, ready to recycle into something adorable. There is a nice photo glossary of basic craft tools and materials in the back, too. From clothing to dioramas, toys to treats, science experiments to holiday décor...there is something for every child here. Click here to watch videos! I found plenty of projects that are fun for grown-ups to make too, like an accordion-fold treasure box. I adapted the idea by altering an Altoids tin - I turned it into a gift-card holder with an accordion-fold birthday greeting. I kept the project simple enough for kids to make too, by just gluing cardstock to the top and bottom of the tin and using stickers and handwriting to embellish. The gift card sits at the bottom, under the last fold. 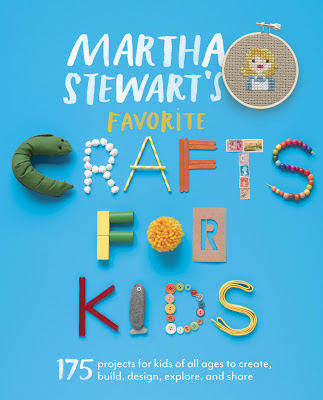 Martha Stewart's team was kind enough to send me this book to review...and I'd love to give it away to a crafty parent, grandparent or teacher out there...just follow the instructions below for lots of chances to enter to win!